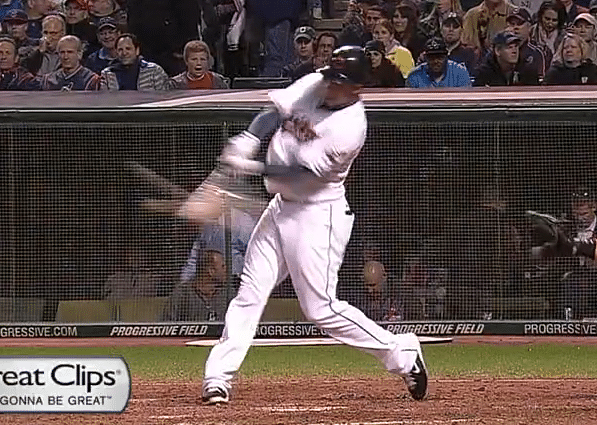 You are here: Home / Topics / Build More Power / Michael Brantley VIDEO: How-To BOOST BABIP? 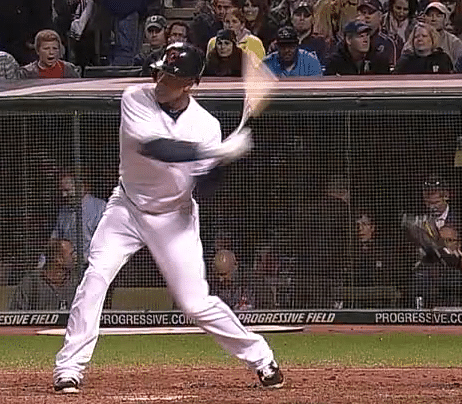 Why analyze Michael Brantley (lefty hitting outfielder of the Cleveland Indians)? How can he improve his repeatable power? According to FanGraphs.com he’s 6 foot, 2 inches, 200 pounds. Not a big guy by today’s standards. 2014 was the first time he was selected to the American League All-Star team. Home-run to fly-ball% more than DOUBLED! Strikeout% almost cut in half! Yes, according to my stat table, the 2014 season isn’t done yet. But the amount of “hits” he accumulated in 2013 (158) is virtually the same as 2014 (151). Hits are a major part of the BABIP equation. So, what is he doing differently with his mechanics? What’s the Difference in his 2013/2014 Swings? After Brian Petrick sent me that question, I obsessed over how-to build consistency into a hitter’s swing (increase BA & BABIP) that could also cut down on strikeouts. My hypothesis was to get the barrel on pitch plane EARLIER (closer to the catcher), which would translate to more margin for error afforded by the batter. If the barrel entering the impact zone is closer to the catcher, driving the pitch to the opposite field is an option. However, if the same barrel enters the impact zone closer to the pitcher, the hitter is more likely to swing and miss or hit the ball weakly. “standing up” in his 2013 swing. Homer Kelly, an aeronautical engineer for Boeing back in the 1930’s, applied scientifically proven human movement principles to the golf swing. 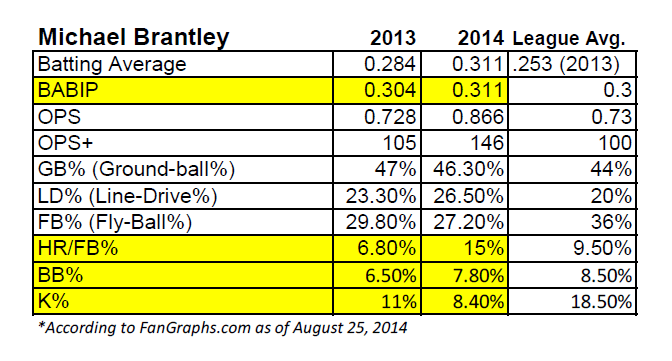 According to FanGraphs.com, Zip (U) and Steamer (U) statistics predict Brantley will hit 20-21 homers in 2014. This would double what he did in 2013. The same predictive stats show he’ll finish between .846 to .849 in OPS (On-Base + Slug%). Conservatively, this would be a dramatic 118 point rise! Hiding hands from pitcher more. You saw the difference bending the back leg more at impact does to key offensive numbers like BABIP, BA, and Strikeout%. Also just as important is how close to the catcher a batter’s barrel enters the pitch plane, and how well his “stay through” is after contact. Brantley already does these well. However, at the very least, if Michael Brantley engages the natural springy fascial material within his body (mechanical tweak #’s 2-4 from above), then he can be one of the top-10 hitters in the league! https://hittingperformancelab.com/wp-content/uploads/2014/08/michael-brantley-2013-5.png 404 462 Joey Myers https://hittingperformancelab.com/wp-content/uploads/2018/05/hitting-performance-labs_c90c0362088ef1d3d528f3078f4f8ac1.png Joey Myers2014-08-29 04:28:342019-01-21 05:38:05Michael Brantley VIDEO: How-To BOOST BABIP? You love challenging old myths. It doesn’t matter who it is, or what they say, (and that goes for yourself as well) … you hold their feet to the fire until the truth comes out. There are still people who think you have to swing down to make the ball go up! The fact that a ball can get more lift for longer with backspin is secondary to swing plane. You get backspin by hitting the ball just under the mid point. If you hit it dead on it will ‘knuckle ball’ on you, and if you hit it on the top it will head down. All of those facts have nothing to do with swing plane. You can top out swinging down too. Getting on plane is about putting the bat on a collision course with the ball, and getting the bat heading in a direction to propel it over the heads of the infielders. There’s a reason that pitchers are paid a lot of money for high ground ball percentages. Pitchers don’t try to strike you out – they try to get you to miss, or miss-fire. They’ll take the ground ball over the fly ball every time, because they have the chance for the double play, or at least to get the lead runner, and there’s no opportunity for a sack fly. If you are swinging level to the ground or down, you are going to hit mostly ground balls when you get to better pitching, because they just keep the ball low in the strike zone. At that point you’ll move down in the lineup until you’re useless, and you’ll have gone as far in the game as you’re ever going to go. I agree Bob. Down & Through doesn’t work at the higher levels. I know. My batting average from High School (.400) dropped after four years of Division 1 college ball to a career .250. Pitchers get better at exploiting the swing plane flaws of Down & Through. They can determine a solid game pitching plan for Down & Through hitters just by watching batting practice. Not so easy with scientific movement hitters. With these hitters, they have to “see as they go”. Good point about the pitchers game plan. Pitchers and ball coaches love playing teams that keep the ball on the ground. It most often means your pitchers will throw less pitches – getting the ground ball out in the first three pitches as opposed to going deep into counts. You name one pitcher at any high level who wants strike outs before grounders. Strike outs means you have to paint the zone and throw at least 3 pitches per batter. With down plane hitters, you just have to throw a low fast ball inside for the first two pitches, and most of the time one of them will be an easy out. On the other hand … teams that hit the ball hard in the air are more dangerous, which means the pitcher has to mix it up more. He’ll throw more balls, thus walk more batters, and throw more pitches in general. He’ll have to use all his tools and be dead on with his location or he’ll get hurt bad by the deep ball. Pitching to teams that are poorly coached to swing down and through (usually with no stride) is like playing against a whole team of pitchers. You quite often get those innings where your pitcher throws 7 pitches and he’s trotting off the field. I couldn’t agree more with you Bob. Unfortunately, a majority of Little Leaguers are being taught to hit the ball on the ground because fielders can’t play catch. This is a difficult habit to break on the bigger diamond. New young hitters that come in to see me that have been conditioned to hit the ball on the ground can take months if not years to unwind and correct. It doesn’t have to be this way. You hit the nail right on the head my friend.